Let's set your business hours. To set your hours, select your desired time from the drop down menus on your left. Check the boxes under each day that you would like those hours to apply. 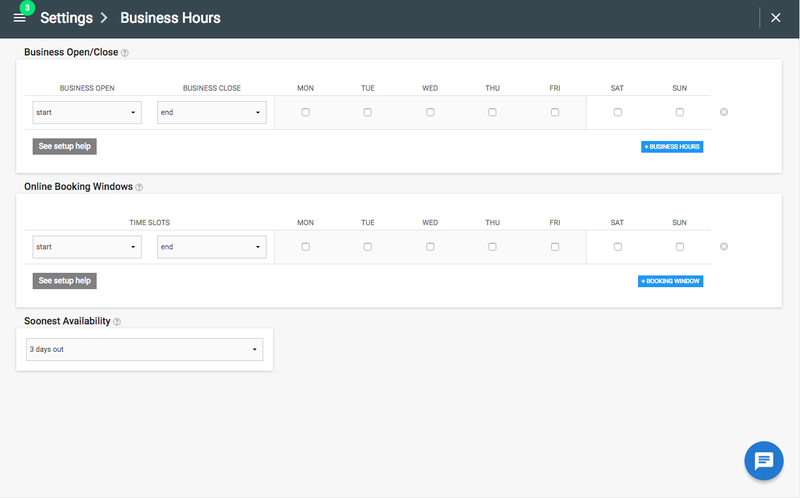 To add another set of business hours, click the blue '+ Business Hours' icon on the bottom right of the window. Business hours will be displayed to your customers who use online booking on the left side of the screen and will also determine the hours you see on your calendar view. If you offer 24 hour services, we recommend putting your 'Business Open' time as Midnight/12:00am and 'Business Close' as 11:30pm. Use the drop down menus on the left side under 'TIME SLOTS' to choose the start and stop times of your arrival windows. Then use the check boxes on the right to choose which days of the week those time slots apply to. Click 'BOOKING WINDOW' to add another set of time slots. Click the drop down menus under 'Soonest Availability' to pick how soon a customer can book a job. Click 'SAVE' to finalize your changes. A customer will not be able to book into an Online Booking Window if a job, estimate, or event is already scheduled during that time. For example, if a window is set for 10:00AM - 12:00PM and a job is schedule for 9:00AM - 10:30AM then the window will not be available to book into. Now that we've set up your business hours, let's get you set up to take card payment in the field or from the office.